Commonly called the Pickle Factory for its most recent use, this vacant industrial building in Beaufort was completed in 1921 and signifies the city’s attempt to diversify its economy in the early twentieth century. The space, strategically located along the former Charleston and Western Carolina railroad line, was intended for use as a meat packing facility. During an archeological survey of the property, a railroad spur was discovered that directly linked to the building’s loading dock. However, the business was to be funded by local subscriptions of stocks in the company, and due to lack of payment by many subscribers, the company was unable to open. Instead, the building served as storage space for groceries from 1928 until around 1940. 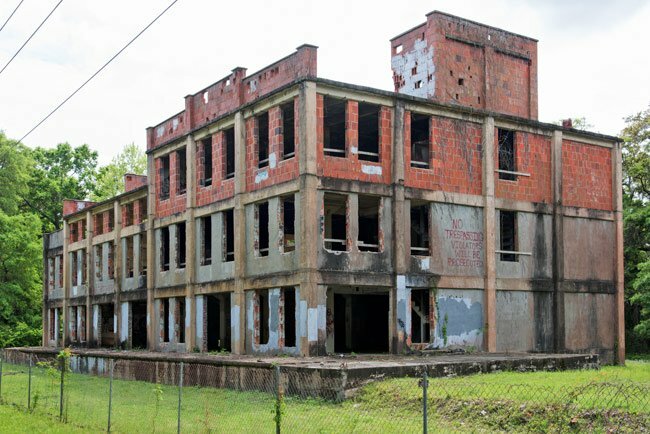 It was also used as a tomato canning and pickle packing plant from roughly 1932 until 1940, and again from 1945 until 1947. 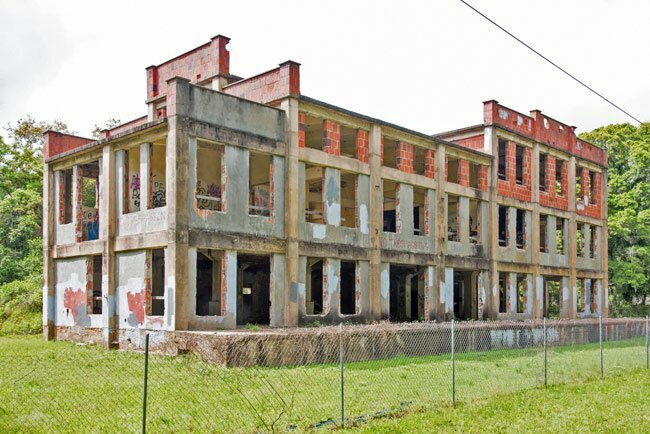 The building has stood empty and vulnerable since the mid-century, yet remains significant as a reminder of Beaufort’s modern foray into industry. The building can be seen along the Spanish Moss Rail Trail. Long referred to as “the Pig Factory” or “the Slaughter House” but more recently better known as “the Pickle Factory,” the Seacoast Packing Company is significant for its contributions to the Beaufort economy in the areas of industry and agriculture. Built 1920-1921, it is important to the history of the city because it was constructed at a time when Beaufort was trying to diversify its economy. Funded by local subscription in company stocks, the construction of the meat packing plant was conceived as a community development project to improve the economic condition of the area. After the almost immediate failure of the meat packing enterprise, the building was utilized from 1928 to ca. 1940 for grocery overflow storage, then from 1932 to ca. 1940 and from ca. 1945 to 1947 as a tomato canning plant factory and pickle packing plant, respectively, contributing to the continued significance of the structure for its role in truck farming in the region. The building stands as one of the only remaining early twentieth century industrial buildings in the city limits and is now surrounded by a single-family residential area. The building was designed by Brooks Engineering of Moultrie, Georgia, as a poured-in-place concrete frame with a structural tile wall infill system typical of the time period, but unique to the area. The tile has been covered with stucco on the lower two levels, most likely as a result of the infilling of windows when the building changed use or was employed as a warehouse. The original tile is still exposed on the upper floor of the structure. The east façade, which faces the railroad and has a stepped parapet wall, is the building’s primary façade. Hello Tiffany, according to public tax records it looks like the owner of the property is the Pickle Factory Condos LLC. We hope that helps! I live in the neighborhood that the pickle factory is located in, I would like to know who currently owns the property. Can you point me in that direction?